Are you a western rider who thought dressage was just for beautifully braided horses and riders in black jackets and white breeches? Well, think again. Western dressage is a cool new equestrian sport, and, if you ride an obedient horse that doesn’t get grumpy doing flatwork, you should give it a go! After all, dressage is just the French word for training, and we all need to train our horses if we’re going to have fun with them. Western dressage is pretty much like traditional dressage. There are tests to learn, and you’re judged on things like straightness, impulsion, the quality of your horse’s gaits, transitions, roundness of circles and submission—which assesses whether your horse accepts the bridle and how light he is on the forehand. Your riding skills are judged too. How correct is your seat, and are you using the aids effectively? The Western Dressage Association of America (WDAA), North American Western Dressage (NAWD) and the United States Equestrian Federation (USEF) offer free downloadable tests that range from Intro to Third Level. There are also freestyle tests for every level. NAWD actually holds virtual western dressage shows that you can enter without leaving your own arena! Western dressage is designed for western horses, so your horse doesn’t have to be a flashy mover. The judge isn’t expecting to see the extravagant movement of, say, an Olympic star like Valegro. 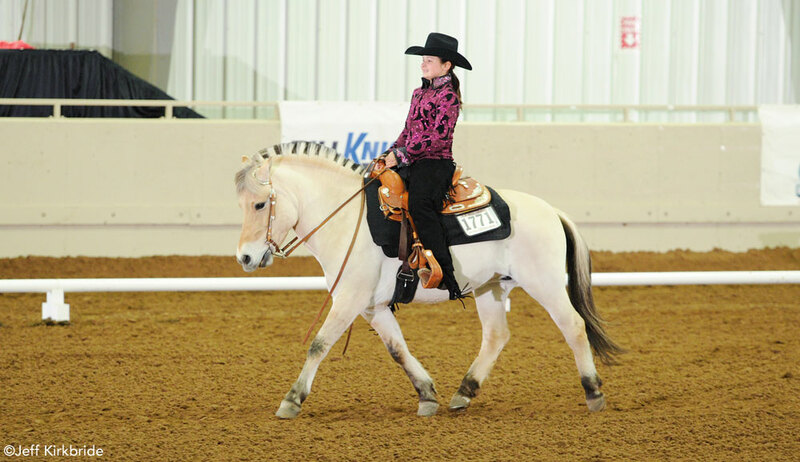 She just wants to see a loose, swinging stride that is natural to your horse’s breed or type. Gaited horses can do western dressage too, but instead of jogging, your horse should perform his saddle gait. In fact, any horse can do western dressage. We chatted with Gabby Watson, a western dressage rider from Ohio who competes a Fjord Horse, and Ivy Reed, Penn., who rides an Arabian-cross. Gabby, 12, learned about western dressage from her trainer, Leah Wilson of the Western Dressage Riding Center. Gabby began doing western dressage on her sorrel Quarter Pony mare, Lola. Sadly, Lola had to be retired soon after, but it wasn’t long before Gabby found a new mount, Init 2 Winit (Winnie), a super-cute 13.2-hand Norwegian Fjord mare. “Winnie came to me barely green broke,” remembers Gabby. “But with the help of Leah, we’re turning her into a wonder pony. Last year at the WDAA World Show, we placed in the top five in three classes, the top ten in two, and I even beat a top western trainer in the Open Intro class! Gabby takes weekly dressage lessons. “We work on bending, transitions, suppleness, frame, speed, my position, lateral work, riding down the centerline, and straightness. I also memorize the tests I’ll ride during the year,” says Gabby. Gabby thinks that western dressage helps her with other riding activities. “Western dressage teaches me how to use my aids for the best results with my horse,” says Gabby. “When my tests come back, the judges’ comments help me know what I’ve done well and what I need to improve. So do you need any extra equipment or show gear to do western dressage? According to WDAA rules, a standard stock saddle, pad and breastplate are fine for western dressage. What kind of bridle should your horse wear? A snaffle, bosal or curb bridle. The WDAA strongly recommends that you use a snaffle bridle on a junior horse aged 5 years old or under, and all curb bits must be free of mechanical devices, including extensions, rivets or prongs. When you decide what tests you’d like to do, it’s a good idea to read the organization’s rules before you jog down the centerline at your first western dressage show! Ivy, 10, competes in both English and western dressage on her Arabian-cross, Malachi. Ivy was the first student at her barn, Let’s Dance Dressage in Clearfield, Penn., to try western dressage, and it wasn’t long before she was winning lots of blue ribbons. Ivy, a member of NAWD, also enjoys preparing for shows. This article originally appeared in the May/June 2015 issue of Young Rider magazine. Click here to subscribe!